The 1st project of the Summer of Making was a Water balloon launcher. Pretty simple and the kids loved being able to help out in the building of it. We followed the instructions verbatim from the Make magazine link. 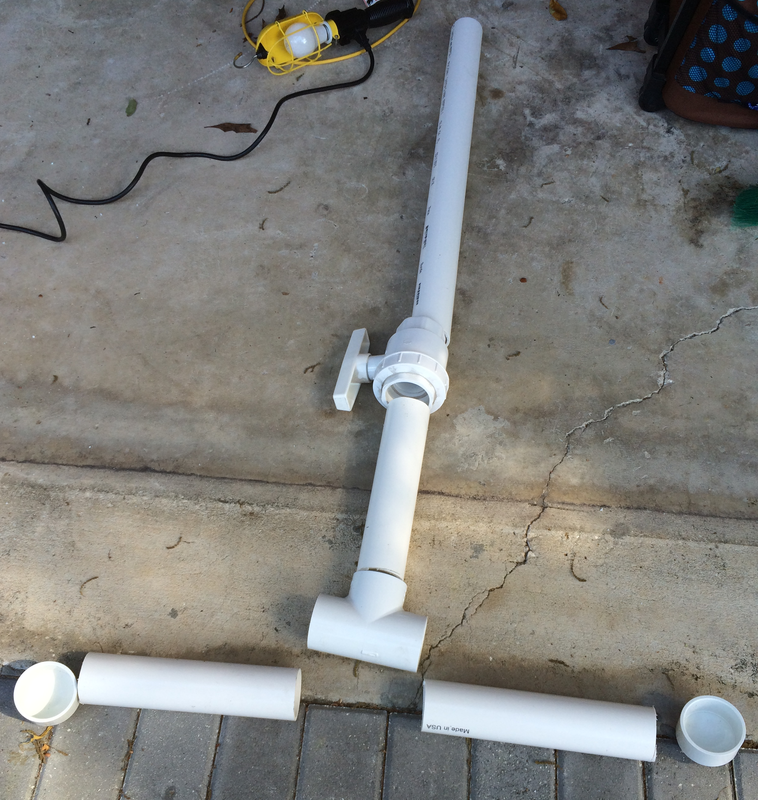 If it’s not clear – it wasn’t to me – you want to purchase 2″ inner diameter PVC pipe. Total cost was $24, with nearly everything sourced from Lowe’s home improvement store. I had some left over PVC glue from a previous project and the local tire place gave us the valve stem for free. Here are the parts laid out. Measuring out the main launch tube for cutting. Measuring out the secondary tube and end handles that make up the air reservoir. All the cut parts laid out for a sanity check before gluing. We placed the valve stem on the right side tube that makes up the handle. Drill the hole small and work up to the size you need. Wow, it was a tight fit! It works very well. Our first test shot went nearly 60 ft. It takes some playing around with the balloon size, amount of water “batting” used and the air pressure. So far our best results have been with a water balloon that fits just barely in the barrel, about 2-3 inches of water batting and ~25 lbs. of air pressure. UPDATE: (4/17/2015) 6 inches of water batting and 40 lbs of air pressure, sent a water balloon over 100 ft away. The project was a lot of fun and I highly recommend it if you have some younger children looking to build something fun for the summertime . I’ve been reading a lot about the Maker movement going on and I have to admit, I’m feeling a bit inspired. Not sure if it’s the inner kid in me wanting to play with some of these amazing new gadgets like 3D printers and Robitics kits (which I’ve always be enthralled with), or the desire to control real world things with software. Either way, I’ve been busy researching all kinds of projects I might be able to tackle with my two boys. I’ve got some parts and kits on order, from Arduinos to random sensor modules to robotics parts. I backed a kickstarter for a 4-in-1 drawing robot called the mDrawBot which should be arriving some time in May. I plan on making this the summer of “making” with my boys. It’s my answer to the “What’s there to do?” question I hear every summer when the kids are on summer break from school. Stay tuned for our 1st project, a water balloon cannon!